Upcycling is popular in home decor right now. There’s an endless amount of beautiful possibilities when you combine an old piece of furniture, some sandpaper and paint. Today we’re bringing you five ways to upcycle your old window shutters when you replace them with new ones from Tri-State Windows, Siding & Roofing. We’ve scoured the Internet for the best tutorials. All you have to do is sit back, watch and grab a can of paint. Get organized with this tutorial on how to use spray paint to change the look of an old shutter, apply backing board and key hooks to create a key holder and mail sorter. You could also use this same tutorial to create a jewelry holder, which is another popular use of an upcycled window shutter. For this project you can use a wood shutter that already has paint chipping off of it for a weathered look, or you can add a new coat and distress it for a vintage look. Either way this tutorial from Good Housekeeping will help you create the perfect side table for your sunroom or outdoor space. If you do use an old shutter with chipping paint, make sure you apply a coat of clear sealer to secure any lead paint that could pose a health risk to your family. If a more refined look is more your style, check out this tutorial from HGTV on how to turn an old shutter into a sofa table. This will require some extra sanding in order to get a smooth finish, but the results are worth it. You’ll need to know your way around a few power tools for this tutorial. Follow along with My Repurposed Life for step by step instructions on how to turn four identical shutters and a few extra pieces of wood into a beautiful bookshelf. This blogger used a paint sprayer, which is a good alternative to spray paint, in order to get a smooth finish with less effort. Click here for this tutorial. 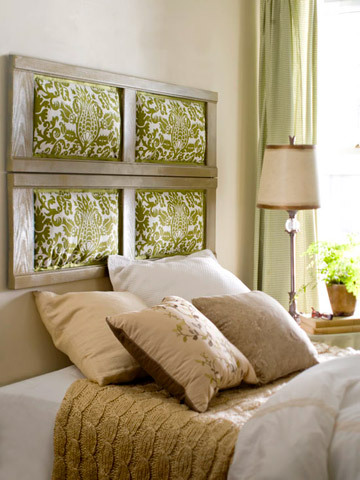 No need to shell out hundreds of dollars for a new headboard. This tutorial from Better Homes and Gardens teaches you how to combine two old shutters, fabric to match your bedroom décor and a little spray paint into a sleek headboard for your bedroom. Best of all, this project can easily be completed in a weekend. For more ideas on how to upcycle your old window shutters, click here to check out our Upcycle Pinterest board. This entry was posted in tips, transformation, windows and tagged Siding & Roofing, Tri-State Windows, upcycle, upcycled shutters on May 28, 2014 by Hank. There’s nothing quite like the look of wood siding. Those shakes, scallops and shingles add character and beauty, but they can be difficult to maintain. Thankfully there are siding products available that recreate the natural look of cedar, and combine the durable, low-maintenance benefits of vinyl. That way you can have the warm wood look you want, with the high-performance of modern siding materials. At Tri-State Windows, Siding & Roofing we carry Portsmouth Cedar Shingles. Designed with a deep rustic grain patterned from real cedar shingle, the seamless design is resistant to impacts, fading and warping. That means there’s no warp, rot, cut, twist or, most of all, repainting. Portsmouth Cedar Shingles come in traditional shake, staggered edge, half rounds and hand-split shake. Depending on the style, Portsmouth Cedar Shingles come in up to 22 colors from white to black walnut. Cleanup is easy, a simple garden hose removes most airborne dust, and the easy upkeep will keep your curb appeal looking good for years. Click here for more information about Portsmouth Cedar Shingles, or to schedule your free estimate. This entry was posted in home, siding and tagged half rounds, hand-split shake, Portsmouth Cedar Shingles, Siding & Roofing, staggered edge, traditional shake, Tri-State Windows, Vinyl siding that looks like wood on May 21, 2014 by Hank. New siding, windows and doors, but the highlight of this renovation are the four pillars Hank and the Tri-State Windows, Siding & Roofing crew added to the front of this Davenport home. The pillars lengthened the appearance of the split level home, making it look more like a two story home from the street. The pillars also add a touch of elegance and curb appeal, setting the house apart from the others in the neighborhood. Other features that helped define the front of the house are the new Berkshire windows. The classic double-hung windows with white trim brightened up the front of the house. New black shutters, keep the look of the home consistent, while providing a classic accent. The home was also modernized with Royal Crest Dutch Lap Siding. Offering a thinner, sleeker look than the previous siding, the new look also exceeds industry standards in durability, color retention and warranty protection. Its UV resistant design will keep the home looking beautiful for years to come. One last touch that stayed true to the original home design, while offering a modern update is the new front door. No longer a dark mass, the new door features large windows that let in additional light and white trim for a pop of brightness. For more information on Tri-State Windows, Siding & Roofing or to get an estimate for your home remodel project, visit our website. This entry was posted in before and after and tagged before and after, Davenport, pillar, Siding & Roofing, Tri-State Windows, Windows on February 5, 2014 by Hank. Choosing the right window for your home can be a challenge. You have to consider your home’s architectural features, what room the window will go in, if it needs to perform a special function, such as egress for a basement bedroom. Today we have Hank’s Top 5 picks for windows in your home. He’ll walk you through the benefits of each one and how each style is generally used to enhance your home’s curb appeal. One of the most popular styles of windows, this classic style has top and bottom sashes that open halfway, allowing for lots of air circulation. You upgrade to a double hung tilt option, which allows the sashes to tilt inward for easy cleaning. Double hung windows are excellent for any room in the house, but are most frequently used in bedrooms and bathrooms. A perfect choice for a modern or contemporary home, horizontal slider windows are a popular choice for bedrooms, rooms with just one window and over kitchen sinks and counters. That’s because the horizontal sliding window is often found to be easier to open than double hung, or crank-style windows. The windows also provide an excellent source of ventilation and are an ideal choice for basement windows, allowing air and light to come in, without the need to dig out the foundation to make room for a double hung window. An arch window, also known as a radius window, provides a dramatic look for both contemporary and traditional homes. You can use arch windows by themselves or with any other window combination to add an extra touch of elegance to your home. Radius windows can be manufactured to be tall or wide depending on your home’s architectural needs. From a functional perspective, most radius windows are used just as an additional light source and are usually combined with other types of windows that are operational to allow for ventilation. They are ideal for living rooms, dining rooms or other formal rooms facing the street to enhance your home’s curb appeal. A popular addition to living rooms and master bedrooms, bay windows are a combination of three or more windows that extend dramatically from the home. A bow window is very similar, except it is formed of four or more windows joined at equal angles to give the illusion of a curve. Bay and bow windows provide an architectural accent that adds light, interest and curb appeal to your home. Often bay and bow windows are flanked with double hung windows to provide additional ventilation. Strictly speaking an egress window is a window that is large enough to climb out of in the event of a fire or emergency. They are required in all bedrooms and are a popular addition to finished basements. Double hung or horizontal sliders can both be used as egress windows, as long as they are large enough to meet the building codes where you live. For basements, a large and deep window well also needs to be dug and reinforced in order to accommodate an egress window. For more information about window choices or to get a free assessment of which style will be best for your home, click here to contact Tri-State Windows, Siding & Roofing. We’d be happy to come out and give you our recommendations and a free estimate. This entry was posted in windows and tagged arch, bay, bow, contemporary homes, egress, popular styles, radius, Siding & Roofing, traditional homes, Tri-State Windows, Windows on February 5, 2014 by Hank.